Two defending champions crashed out of the National Elite Championships at the first hurdle at Dublin’s National Stadium on Saturday night. Portlaoise BC pair Wayne Kelly and Michael Nevin, who claimed their first Elite belts last year, exited at the last-eight stage to Antrim’s James McGivern and Galway’s Gabriel Dossen in the light-welter and middleweight divisions. 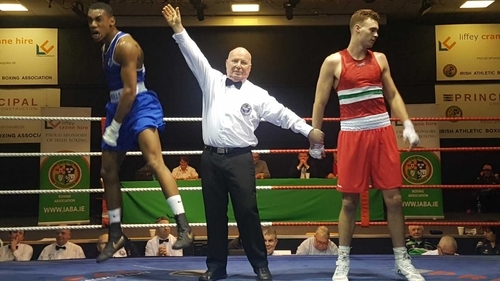 McGivern, a 2018 Commonwealth Senior bronze medallist and 2015 Commonwealth Youth champion, earned a unanimous decision over Kelly and believes he’s on a golden run. He said: "We knew coming down that Wayne would be a big fight and it was a very tactical fight. I couldn’t afford to daydream or let the concentration slip. I’m hitting a gold run of form now and I’m excited for next week." The Ulster stylist agreed that getting a bout under his belt on Friday night heading into this evening’s decider was a factor. "Defiantly, yes. I haven’t fought in the Stadium in a while, so getting back down and getting used to being back in that ring was handy," he added. Kelly admitted he didn’t get out of the blocks fast enough but vowed to return. "I got a slow start tonight, haven’t fought since November. I came on strong, I felt I did enough. That’s life, I will be back with a bang," he said. Meanwhile, Dossen edged Nevin on a 3-2 split after a see-saw 75kg three-rounder. Both young men claimed World Youth gold for Ireland in St Petersburg in 2016. Dossen’s coach, Mike Mongan, said they were thrilled with the win and hailed the performances of both boxers. "It was a fantastic bout and it lived up to what it was predicted to be. Gabriel boxed excellent and stuck to the game plan," said the Olympic BC chief seconds. Later this evening, Commonwealth Games finalist Aidan Walsh beat former Elite champion Dean Walsh, a nephew of USA head coach Billy Walsh, on a 4-1 split verdict. Tipperary’s defending super heavy champion Dean Gardiner recorded an inside the distance win over Tommy Sheahan to advance to next weekend’s semi-finals and Paddy Donovan beat Conor Ivors in a Limerick derby. Galway’s defending welterweight champion Kieran Molloy progressed at the expense of Mayo’s Aaron Daly. "I felt very comfortable in there and looking forward to the semis where I will put in another big performance towards defending my title," said the Oughterard BC southpaw. 31 bouts were completed over the first two days of competition this weekend. The Championships resumes next Friday.